After Elora Pertin teamed up with the empire’s rogue assassin and a group of misfits to thwart the emperor’s plans and destroy his genocidal weapon, they went on the run to escape his fury…but maybe not for long. A traitor in their midst could unravel everything. After all their plotting and scheming to oust the emperor and earn redemption to go back to their normal lives, they still couldn’t catch a break. The empire always seemed one step ahead of them—inside information made it easy. Is the informant one of Elora’s crew or the group’s newcomer? Join Elora, Mordecai, the ragtag crew, and an unlikely ally as they fight against the empire that would silence them. Redemption is now available for purchase on Amazon (paperback and ebook). For an autographed copy, click the "buy now" button. Elora finds herself fighting for her life against the Empire she once served, abandoning everything with only a handful of friends and an unlikely ally—the Emperor’s deadliest assassin. Will he prove himself true as her protector, a loyal servant of the Empire, or a romantic distraction? With the law and assassins searching the star system for them, Elora and her team are determined to accomplish their mission…or die trying. 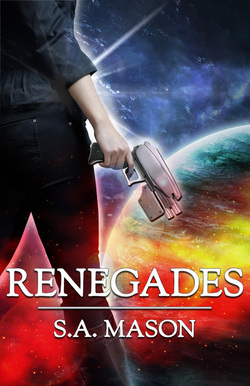 Renegades is now available for purchase on Amazon (paperback and ebook), Barnes & Noble, Smashwords, and Kobo. For an autographed copy, click the "buy now" button. Note: It could take up to 14 days to receive a signed copy since the book will have to be sent to me first. Get the Latest News and Updates! Subscribe To My Newsletter.